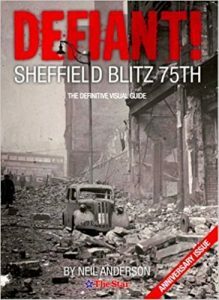 Neil worked in the pub­li­city depart­ment of the town hall, and on the 70th anniversary of the Sheffield blitz, decided to write a book filled with recol­lec­tions of the blitz from people who lived through it. The reason for the blitz was to wipe out the arma­ments factor­ies of the East end but the bombs were dropped on civil­ian areas in the sub­urbs and the town centre. A pos­sible explan­a­tion for this will be given later. 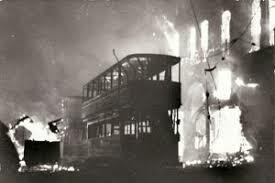 Sheffield people were aware and expect­ing a raid and the steel works had stepped up pro­duc­tion in the late 1930’s. Buildings were requisi­tioned for air raid shel­ters and many Anderson shel­ters were pro­duced for local homes. There was not very much evac­u­ation of chil­dren at this time and many of the women were work­ing in the steel works. When war was declared ini­tially theatres and enter­tain­ment centres were closed, but then after having no air attacks and hear­ing sirens scream­ing for many nights without an attack, cit­izens became rather blase. In autumn 1940, Hitler decided to bomb Britain and London, Liverpool and Bristol were hit. There was still no bomb­ing in Sheffield and early on December 12th people were going out to the cinemas, clubs and pubs as usual. The sirens soun­ded at 7 p.m. and no-one bothered to take shel­ter. Down came the bombs, wave after wave of bombers, until 4 a.m.the next morn­ing when the all-clear was soun­ded. Devastation had hit the city centre, Atkinson’s, Cockayne’s, Redgates, C & A and Walsh’s were all flattened. Outlying sub­urbs of Gleadless, Nether Edge, Owlerton, Intake etc. were all hit. It was estim­ated that 2,000 people were killed and a tenth of the pop­u­la­tion were made home­less. One of the biggest losses of life was at The Marples Hotel in Fitzalan Square. It was packed with people, none of whom sur­vived. The heat was so intense that a pile of coins were fused together. Fire crews came from Barnsley and Doncaster to help.The City Hall sur­vived, a bomb dropped nearby landed in a water tank! Lots of emer­gency centres were set up e.g. at High Storrs School, and advice centres were able to give help to many people. Atkinson’s and other stores opened small out­lets at vari­ous loc­a­tions through­out the city. Although the ledger, stat­ing vari­ous cus­tomer debts, was des­troyed people still turned up to pay off their debts. There is a dis­play of the Sheffield blitz in the Doncaster Aero Museum, and recently, due to the efforts of Neil Anderson, the Heritage Lottery gave a grant of £90,000 to hold an exhib­i­tion in the old fire sta­tion. Among the exhib­its are the fused coins found in the ruins of The Marples Hotel and videos of people who exper­i­enced the blitz. Knickebein.….… The Germans developed a system of “beams” — an enhance­ment of the pre­vi­ous “lorenz” system which were meth­ods of “blind land­ing aids” used to help air­craft to approach an air­port at night. The Knickebein system sent two beams from power­ful trans­mit­ters at dif­fer­ent loc­a­tions on main­land Europe. These beams were cal­cu­lated to inter­cept over the bomb­ing zone in England. The English, under Churchill’s dir­ec­tion, devised coun­ter­meas­ures which “bent” the beams away from the target area. This would explain why so many bombs were dropped in civil­ian areas rather than the steel man­u­fac­tur­ing plant in the east end. Previous PostRailways in the Cornish Landscape — part 2. — Stephen Gay — 12/02/2018Next PostForensic Sciences – Dr Stefano Vanin — 26th February 2018.